Welcome to Handmade Monday - find out more by clicking the link. It's now featured as a project in the February issue of Craftseller magazine, which is due in the shops in a few days (subscribers should already have their copy). 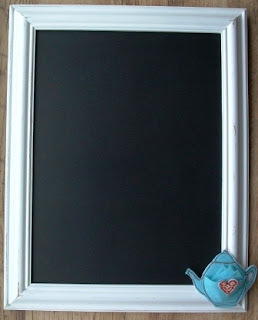 It's made from an old wooden picture frame, updated with a lick or two of paint (and the teapot, of course). The chalk board part is just the old backing board reused. I love a good upcycled project, don't you? I have another frame ready to recycle, extra large this time, rescued from who knows where by someone who just knew I'd use it. I think I may do something similar with that one. 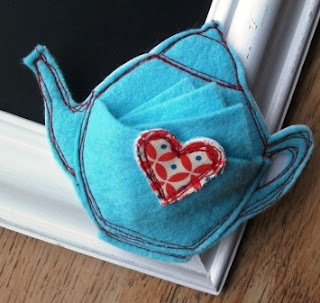 Love the Idea of the teapot for holding dusters and chalk. I'm always losing mine! Congratulations again :). It is a great make. I think you deserve a telegram from the queen as it is an amazing achievement. (bet she would too if she knew about it! )Look forward to reading about this weeks successes. Loving the colour of the teapot. What a good way to re-cycle a frame. 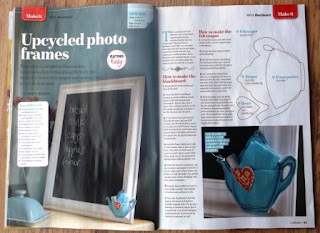 Congratulations on the publication, it's a great way to reuse old frames that have lost their glass. WOW next week is 100 ? That's really great - I'm far far behind with blogging but I enjoy it when I find some time. Thank you for taking the time to run Handmade Monday ! Looking good ! The teapot is such a cute colour ! I really need a chalkboard in my kitchen ! Thanks once again for hosting & can't wait to see what's in store for the 100th ! I really like that chalkboard - getting excited for next week already! A lovely idea for board cleaners - great fun too. On the brink of 100 HMs? Hard to know where the time has gone. Well done Wendy, long may it continue. Hope you have a good week. 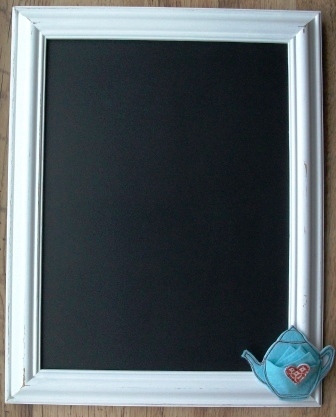 What a lovely idea to upcycle the frame, & love the little teapot. I'm a newbie to Handmade Monday but after putting up my link I've had a wonderful time browsing through everyones else's blogs. What a great way to spend a wet Monday afternoon! That's such a great idea. I'm always losing my piece of chalk and never have anything to wipe it clean with - really clever. I love the teapot, and the chalkboard design. The blue colour is lovely too. Your posts make for such helpful interesting reading.